· Large Boulders. It may seem counterintuitive to add rocks to your yard, but large boulders are masterful additions to landscapes. They are interesting to look at, add height and texture to the garden, and provide an anchor for plant groupings. · Stone Paths. 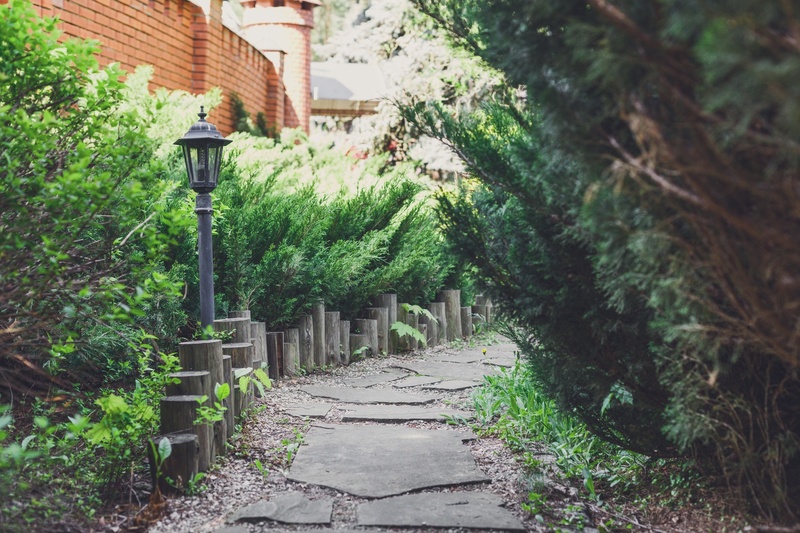 A stone path leading to your yard will add charm to your outdoor space and function to protect your lawn from excessive traffic. · Stone Steps. Most outdoor areas are more appealing with at least minor changes in elevation. Stone steps are beautiful transitions between levels. · Dry Riverbed. Use a dry stone streambed to solve drainage and erosion problems and to enhance to beauty of your yard. Stone riverbeds direct water through your yard during rain and look lovely at the same time. · Borders. Flowerbeds, lawns, and other garden features often benefit from a delineated border. Borders can be made from a variety of materials, including stone, brick, and concrete. They serve to keep your lawn edges crisp and add structure to your space. · Lighting. Landscape lighting adds elegance and safety to your yard. Carefully placed lights can completely change the look of your home and garden during twilight and evening hours. Use lights to illuminate paths, spotlight the highlights of your yard, and cast interesting shadows. · Fireplaces and Pits. Fireplaces and pits add function and ambiance to your garden area. They also increase the amount of time you can spend outdoors and provide a perfect gathering place for friends and family. · Seating Area. Every garden benefits from a well-defined seating area furnished with comfortable and welcoming seats and tables. · Pergola or Gazebo. These structures are classic. Use them to provide visual interest and invaluable shade. · Patio. One of the most basic hardscaping additions is a patio. Make yours generous and inviting and you will find yourself relaxing there day after day. When you include one or more of these elements in your hardscaping in Johns Creek, you are sure to have a yard that is beautiful, stylish, and inviting.